The pit bull terrier is a loyal and affectionate pet. Properly bred pit bulls are stable and easygoing animals that display a kind and gentle demeanor towards humans, but proper breeding requires a systematic approach. Make sure that your pit bull is suitable for breeding. Ideally, you will have a United Kennel Club-registered animal with a verified and traceable lineage. This will allow you to ensure that your dog does not have a genetic predisposition towards any physical or temperamental abnormalities that would preclude breeding. Pit bulls are generally robust dogs, however they can be prone to hip dysplasia in poorly bred specimens. 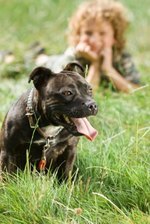 Verify the history of the pit bull that you intend to mate your dog with. Both the male and female should have verifiable breeding and medical records. Again, ideally both animals will be United Kennel Club (UKC) registered. Spend some time around the pit bull you intend to breed your dog with. The dog should appear confident and calm. Skittish or nervous behavior, especially around people, is highly undesirable. Prepare to introduce the male and female dogs to each other. This introduction should be closely supervised. Pit bulls have a genetic disposition that can compel them to fight with other dogs and especially each other. These fights may erupt without cause and with very little warning. It is extremely important to make sure that both dogs are closely monitored while they are breeding. It is also advisable to have a bite stick on hand in case a fight does break out. The two dogs should be allowed to mate several times to ensure the female is impregnated. This may happen over a period of hours or days depending on the individual animals. However, two matings are generally sufficient to ensure pregnancy. Once the male and female have been mated they should be separated to ensure that they do not fight each other.